Center for Healing and Imagery » Blog Archive » What is Somatic Imagery? Over the past 25 years, The Center for Healing and Imagery (CHI) has offered professional trainings in Somatic Imagery™ in an experiential, small group format that enables clinicians to obtain the greatest professional and personal benefit. Our acronym (CHI) refers to the energy of the life force, ones inner essence. At the Center for Healing and Imagery (CHI) we believe that Somatic Imagery taps into that life force, and uncovers the innate human capacity to heal. The power of Somatic Imagery™ lies in its grounding in affect, body sensations, and body experiences. Unlike visualization alone, it emphasizes both the multi-sensory and somatic dimensions of imagery, which deepens the power of the experience, accesses more information and increases the potential for change. Somatic Imagery™ is a dynamic and energizing modality that allows the therapist to effectively target and uncover potential sources of even the most chronic psychological and physical problems. In CHI trainings we teach both guided imagery and interactive guided imagery. In interactive guided imagery there is an ongoing dialogue between client and therapist. The therapist invites the client to share the images, emotions and body sensations as they experience the somatic imagery process. The therapist can then focus on problematic aspects of the experience, help the client move through impasses and conflicts, as well as deepen the positive aspects of the experience. By its very essence, Somatic Imagery™ is profoundly integrative. It is the language of the unconscious – sending healing messages to the body and resolving psychological conflicts rooted in early experiences. This power of Somatic Imagery™ to illuminate the unconscious moves the therapeutic process forward much more rapidly than verbal interaction alone. Consequently, it is a particularly relevant modality in the context of the current interest in briefer, more focused therapies, and with clients when talk therapy is not enough. The Somatic Imagery™ process opens the door to these right brain mental processes, which are a counterpoint to left-brain linear modes of thinking such as verbalization, analysis, judgment and planning. Free of the constraints of linear logic and assumptions, Somatic Imagery™ is highly intuitive, creative, less censored and more open to suggestion. It deepens the psychotherapy by facilitating access to affects. Because imagistic thinking develops before verbal thinking, it connects to the more primitive, sensory and emotionally based parts of the brain and nervous system. Somatic Imagery™, therefore, is a powerful tool for self-regulation. It can be used to quiet nervous system arousal and activation by triggering the parasympathetic nervous system and calming the mind and body. Somatic Imagery™ facilitates perception in terms of wholes and gestalts, grasping larger contexts and connections. A single image can crystallize the essence of a complex problem (and sometimes its solution) without ever analyzing it. Although imagery can be literal, it can also be symbolic and metaphorical in nature. It opens up the imagination and invites the creative resources of the client to engage in the process of growth and healing. It can be creative and playful, leading to the discovery of new solutions to old problems and to the development of new internal resources. Somatic Imagery™ often by-passes defenses, fear and resistance in a gentle way, which makes it a deceptively powerful catalyst for change. It helps overcome a sense of powerlessness and hopelessness and moves clients beyond entrenched thinking and behavior. In this way Somatic Imagery™ interrupts old frozen automatic brain patterns and forges new pathways and options. New solutions and possibilities emerge spontaneously. Somatic Imagery™ is effective with the full range of symptoms and emotional disorders and can be integrated into virtually any therapeutic model or modality. The uses range from whole systems of psychotherapy to adjunctive uses in psychodynamic, cognitive, behavioral, gestalt therapies, hypnosis, EMDR, and Somatic Experiencing. It is helpful in the treatment of cancer and other diseases, and as a tool for pain and stress management. One of the most powerful aspects of Somatic Imagery™ as a tool in psychotherapy is its versatility. It can be used in supportive work: self-soothing, ego-strengthening, and harnessing hidden resources. Somatic Imagery™ can be also used in both exploratory and analytic work as well as in the process of conflict resolution. Exploratory work may be conducted either through the use of a partially structured image, which gives the client freedom to project her or his own perceptions or feelings into the image, or through a kind of “waking dream”, in which the client’s unconscious issues become manifest as the image unfolds. The partially structured images may be based on themes from nature or from mythology or fairy tales; or they may evolve from perceptions of childhood experiences, especially of one’s parents and family; or they may derive from current experience. Our trainings are offered in a variety formats to accommodate different learning styles and learning needs. CHI offers weekend, (either Friday evening and Saturday or just Saturday), monthly, bi-weekly and weekly training formats. The Center for Healing and Imagery, (formerly the Imagery Training Institute), is authorized by the Maryland Board of Social Work Examiners, the Maryland Board of Examiners of Psychologists, and the Maryland Board of Professional Counselors and Therapists to sponsor Category I continuing education programs. Generally there is reciprocity for these credits across jurisdictions. 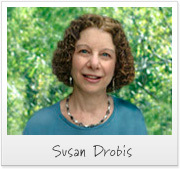 Susan Drobis LICSW is a psychotherapist, trainer and life coach in private practice for thirty years in Washington, D.C., where she works with individuals, couples and groups and teaches and supervises clinicians. Susan is inspired and energized by the power and creativity of a variety of mind-body tools including Somatic Imagery, Ego State Psychotherapy, Hypnotherapy, EMDR, Somatic Experiencing and Mindfulness, and integrates them with self-psychology, object relations, and psychodynamic psychotherapy. Susan also coaches clients in developing life skills that will help them reduce stress and create healthier and more balanced lives.